The girls and I are currently visiting my folks on the Olympic Peninsula where they moved their RV to a couple of weeks ago. 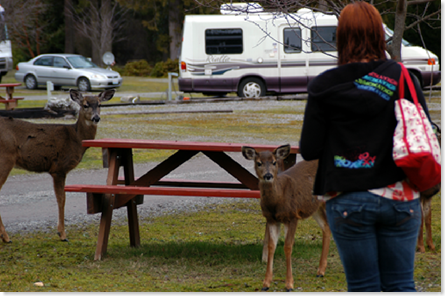 The campground itself is beautiful. Although in the winter time it is a bit on the quiet side as it is filled with seniors enjoying their retirement. Which is fine…unless you are a teenage girl. So we have had to come up with something a little more exciting for them to do aside of trying to make friends with the local wildlife. So amazingly we did find something for the little thrill seekers among us! Details will have to be posted later as we are off for another fun filled day! 7 Responses to Sneak Peek! 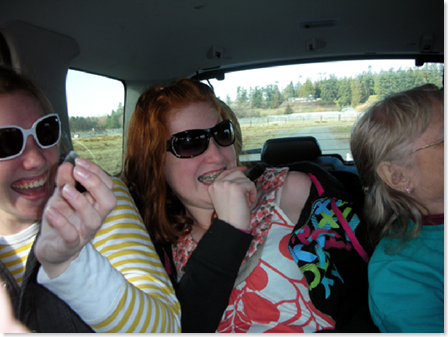 Hmmm…….Olympic Peninsula + three people freaking out about something outside the car = Olympic National Game Farm? Am I right? Sounds like a wonderful time!! Can’t wait to read the next installment. Ok, you’ve got me hanging on the edge of my seat. A fun-filled day with the kids? Sounds wonderful. Looking forward to reading the details. That’s the face I made when a baboon jumped on our car in a game farm. Am I getting warm?